The modern world takes so much for granted! The now humble linoleum floor, with its simple squares of color, was a great luxury when first commercialized in the 19c, since it threw open to the rest of us what only the very rich could afford: decorative flooring that once had to be made of precisely cut polished varicolored marble. These typically geometric 'jigsaw puzzles' made of thinly sliced veneers of stone take no great imagination, just a lot of money. Vitruvius, writing in roughly the time of Augustus, seems to be the first to mention them (pavimenta sectilia, literally "sliced pavements", de Architectura, VII.1.3) but with the expansion of the Roman empire, drawing on the vast resources of many subject regions, vividly colored stone and floors made of different varieties of it steadily grew in favor, finally becoming a hallmark of the Late Antique period: the characteristic orange giallo di Siena from Italy, black-and‑white marble from Aquitania in SW Gaul, yellow Numidian marble from North Africa, green porphyry and the prized red from Ethiopia, and the list goes on. That same list, however, would serve as a catalogue of some of the unhappiest places in the Roman world; such opulence and beauty was bought at a price. Quarrying stone without modern machinery was difficult, dangerous, and unhealthy enough; but the specialized quarrying of these thin slices, or crustae, involving far more dust and consequent death from lung disease, seems to have been the special work of condemned criminals sent to "the mines", to the point where Isidore, writing a chapter on legal punishments in the seventh century, specifically mentions cutting crustae as the reason for deporting the condemned (Orig. V.27.31). Nor did opus sectile ever really die with Roman civilization. 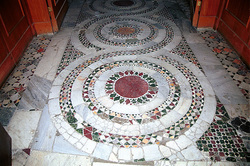 As soon as life in the Western world again got beyond the bare needs of survival, patterned floors of colored stone made their reappearance, at first with the characteristically Italian Cosmatesque work of the early Middle Ages, actually constructed of the débris of Antiquity by slicing up the now useless but still omnipresent marble and porphyry columns of temples and palaces; then in other more modern forms such as the lozenge-paneled pavements seen in so many 18c châteaux throughout Europe.